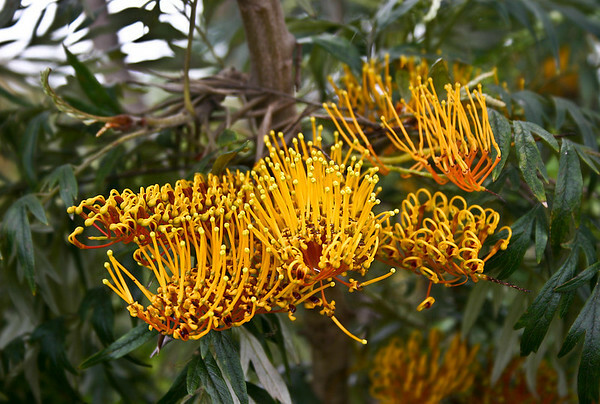 Cooler temperatures and consistently moderate rainfall support a diverse community of invasive and native plant species growing on the always-green cloud-covered lower slopes of Haleakala volcano's southwest-facing flank. 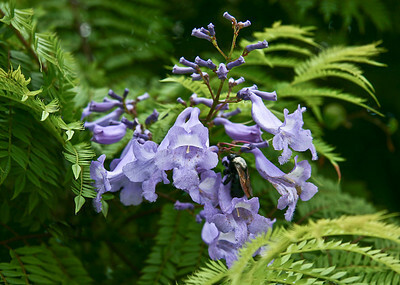 Newly mature blossoms among the lush foliage of a mature Jacaranda tree (Jacaranda mimosifolia). Pi'ilani Highway near Ulupalakua Ranch, south Maui. Masses of Jacaranda (Jacaranda mimosifolia) blossoms hang from trees lining the Kula Road, near Ulupalakua Ranch, north Maui. 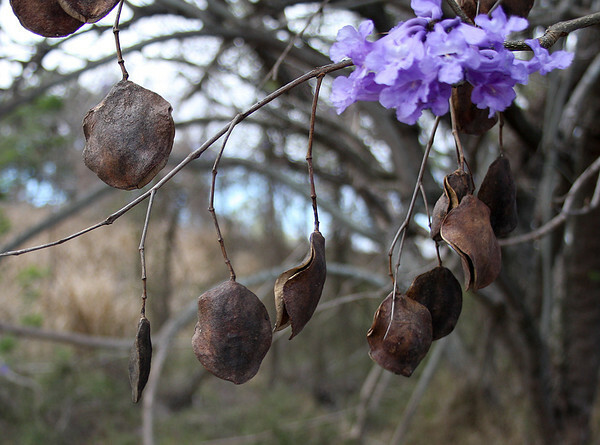 Seed pods and blossoms of Jacaranda (Jacaranda mimosifolia) hang from trees lining the Kula Road, near Ulupalakua Ranch, north Maui. 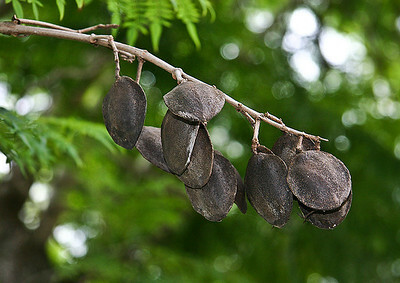 By the first week of Summer, the dark-brown ripened seedpods of the Jacaranda (Jacaranda mimosifolia) appear in small clusters like this one in the upper branches of the tree. Near Ulupalakua Ranch, southern Maui. 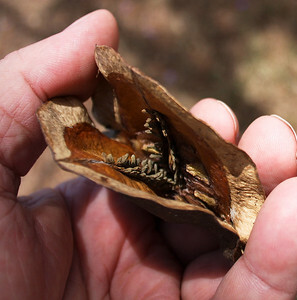 A single mature seedpod of the Jacaranda tree (Jacaranda mimosifolia). 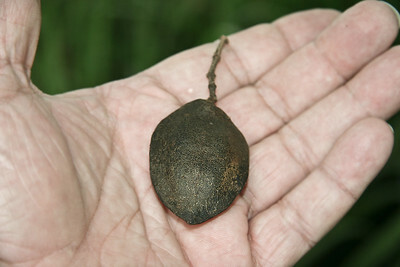 About 5 centimeters in diameter, this large seedpod carries lots of individual seeds that will be scattered on the wind when the pod drys and cracks open. 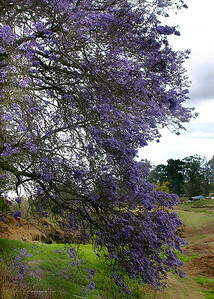 A Jacaranda Tree (Jacaranda mimosifolia) in full blossom in early Spring. 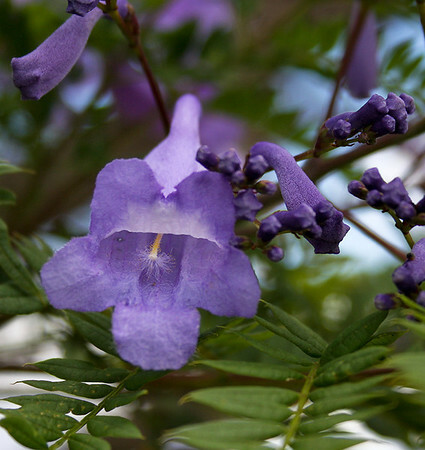 One of the more obvious and popular harbingers of Spring on Maui, the Jacaranda is common in gardens and along roadsides at 2,000 to 4,000 feet on the northwestward-facing slopes of Haleakala volcano. Kula, south Maui. 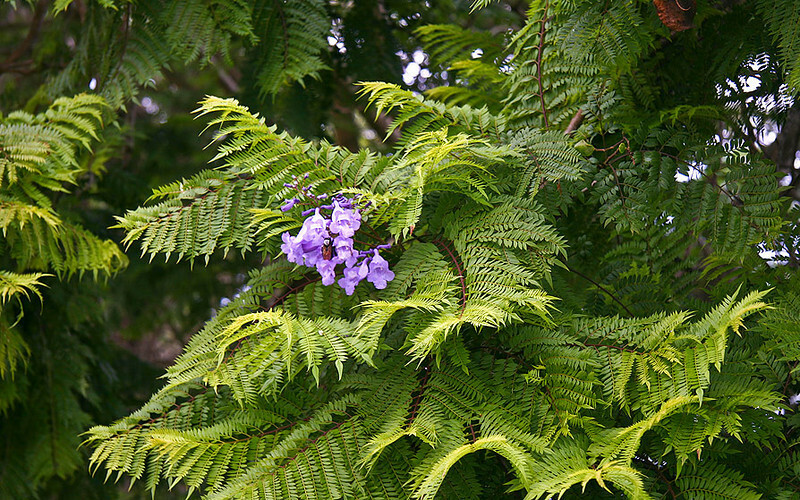 Maturing Jacaranda blossoms, near Ulupalakua, south Maui. 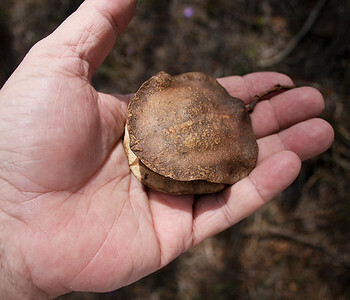 Note immature buds not yet opened. Notice the large solitary black bee in the midst of the flowers: this fellow seemed to be dozing when I shot this extreme close-up. 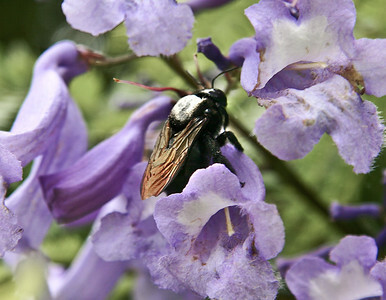 An extreme close-up of a solitary female Sonoran Carpenter Bee (Xylocopa sonorina) snoozing in the blossoms of a Jacaranda Tree (Jacaranda mimosifolia) near Ulupalakua Ranch, south Maui. 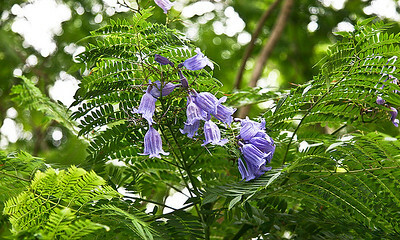 Immature Jacaranda (Jacaranda mimosifolia) blossoms, near Ulupalakua Ranch, south Maui. 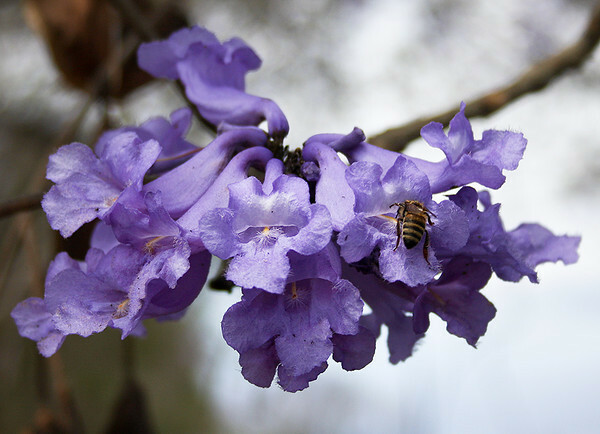 This photo was taken in late June and the Jacarandas are still in bloom. 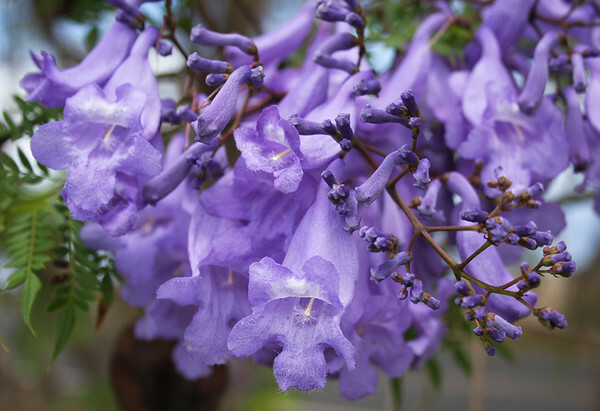 Note the double compound leaves, which cause some observers to assume that Jacarandas are related to acacias. 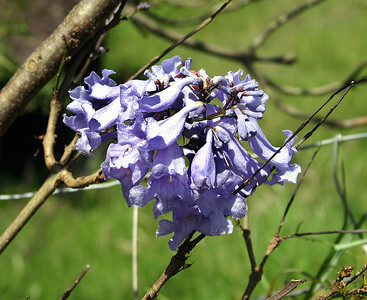 Close-up of Jacaranda (Jacaranda mimosifolia) blossoms. Kula, south Maui. 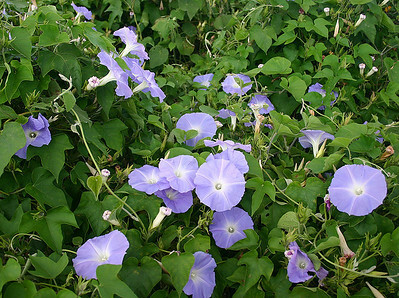 Blue Morning Glory (Ipomoea indica) growing along a side road near the point where the Kula Highway becomes the Pi'ilani Highway, south Maui. 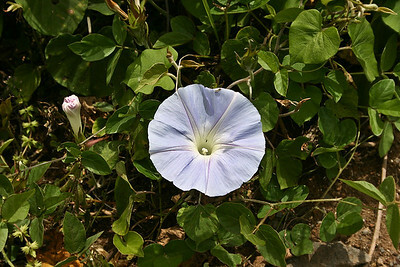 Close-up of the flower and foliage of the Blue Morning Glory (Ipomoea indica), located in a drainage that crosses the Old Haleakala Highway near Kula, south Maui. Note: For the best view of this very detailed image, use the ORIGINAL view mode. 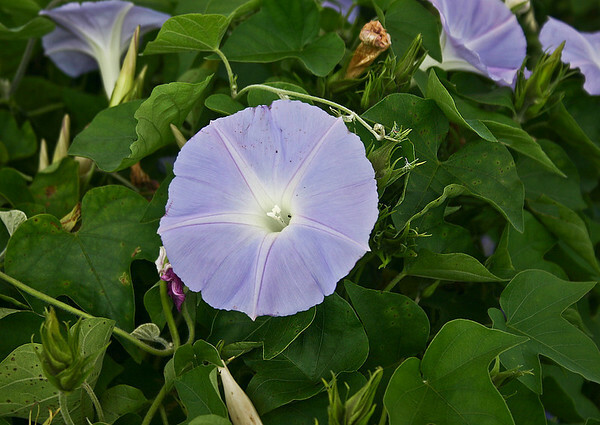 A varient of the Blue Morning Glory (Ipomoea indica) displaying a more heart-shaped leaf than is commonly seen in this species. Upcountry portion of Pulehu Road, south Maui. 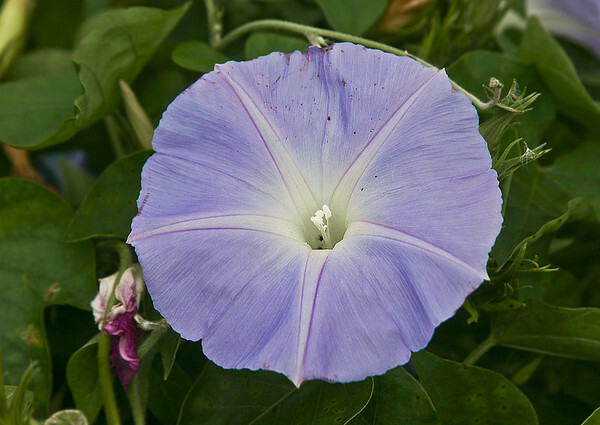 A nice study of a single flower of the Blue Morning Glory (Ipomoea indica), located in a drainage that crosses the Old Haleakala Highway near Kula, south Maui. Note the numerous fine "hairs" coating the vines and tendrils. 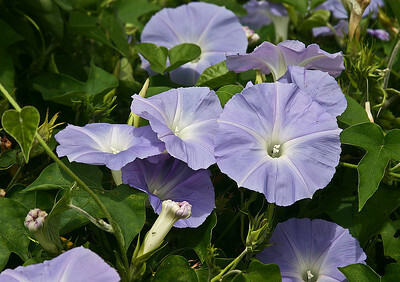 A nice side-view close-up of the flowers of the Blue Morning Glory (Ipomoea indica). Found near Kula, south Maui. 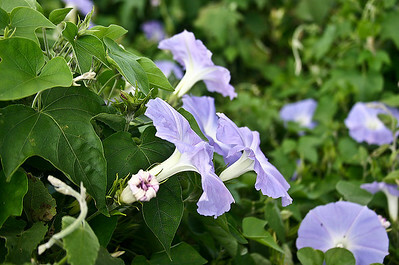 The vines and tendrils of the Blue Morning Glory (Ipomoea indica) busily covering every surface and object within creeping distance. Seen near Kula, south Maui. 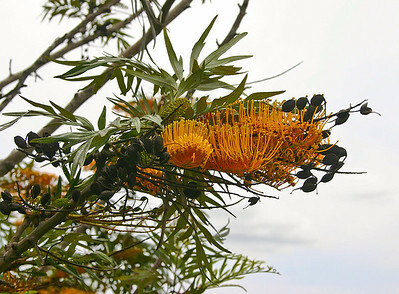 A close-up of the flowers of a Silk Oak (Grevillea robusta), found near the intersection of the Old Haleakala Highway and Pulehu Gulch, south Maui. 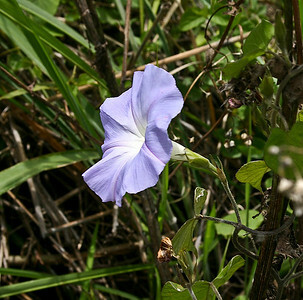 Close-up of the flower and foliage of the Blue Morning Glory (Ipomoea indica), located in a drainage that crosses the Old Haleakala Highway near Kula, south Maui. Note: For the best view of this very detailed image, use the ORIGINAL view mode.